Many birds love honey and peanut butter. Try this recipe out! 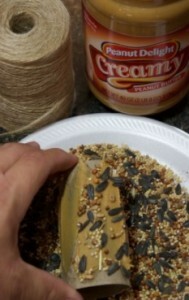 Mix bird seed and millet with the honey and peanut butter. Leave it to harden and then put it out on your feeder for the birds to eat! Mix all of it together in a large bowl. Leave the mixture to harden a little and make into balls. Place the balls in your fridge to cool down for an hour or two. Now place outside on your feeder and serve to the birds. A great winter snack for garden birds!